Win Family Guy Season 16 DVD Boxset! To celebrate the release of Family Guy Season 16 on DVD next Monday, we’ve got 3 DVD boxsets to give away! Expose yourself to this titillating (giggity) collection of 20 uncensored “Family Guy” episodes, in which Peter reveals his sweet K-pop dance moves, Stewie lands a sticky gig as a peanut butter spokesbaby, Brian fetches true love in India, and the gang spends a terrifying night in a totally insane asylum. It’s a haunting and hilarious complete season, featuring celebrity guest voices Ed O’Neill, Margaret Cho, Glenn Close, Simon Cowell and many more! We’ve also got a fantastic deleted scene “Comic Book Shop” which you can check out below! For a chance to win a boxset enter via our competition app below! 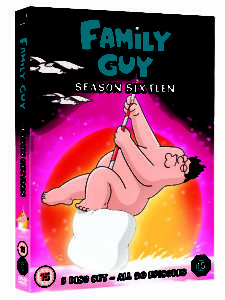 Family Guy Season 16 and Family Guy: The Complete Seasons 1-16 boxset are available on DVD 7th November. The competition ends at 23:59 on 20 November 2016. The prize consists of a Family Guy Season 16 DVD boxset. The winner must supply an address in the UK in order to receive the prize.